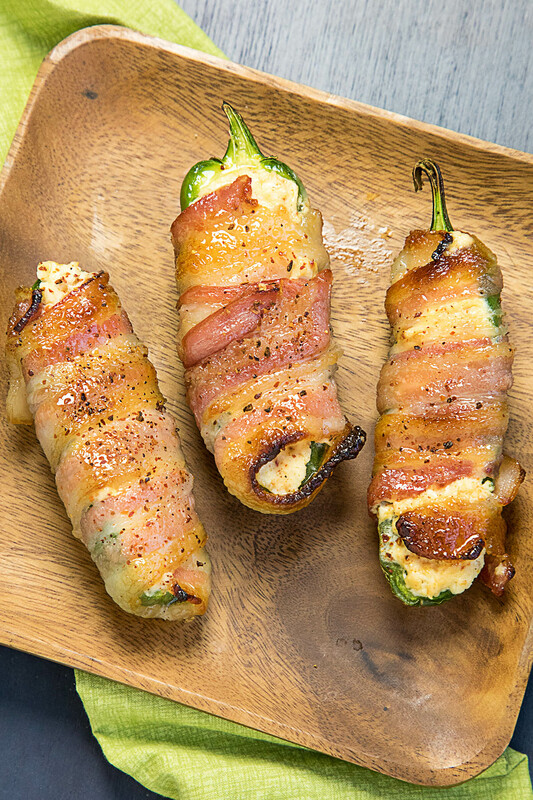 You need this recipe for your next game day gathering or party, with jalapeno peppers stuffed with cheese, then wrapped with candied bacon and baked. The perfect bite, sweet and spicy. 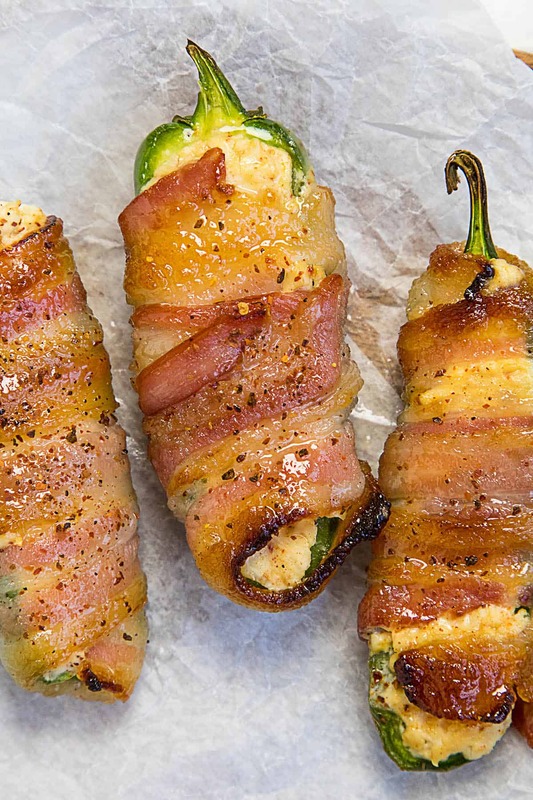 Yes, candied bacon jalapeno poppers are a thing. A very WONDERFUL thing. You guys all know by now that I have a special place in my heart, and stomach, for candied bacon. I mean, just see – Cajun Candied Bacon, Sweet and Spicy Ghost Pepper Candied Bacon, Oven Baked Maple-Soy Candied Bacon – and you ALSO know that I have a special place for jalapeno poppers. I mean, just see – Jalapeno Poppers Recipes and “Jalapeno Poppers and Other Stuffed Chili Peppers” – The Cookbook. What I bring to you today is a wildy AWESOME combination of both. May I present to you, dun dun! Candied Bacon Jalapeno Poppers. Yes! Check these out. These cheese filled morsels are stuffed with honey sweetened cream cheese that’s been spiked with ghost pepper flakes and garlic, then wrapped in bacon that has been generously rubbed with honey and brown sugar. I think you need to make these for your next party and then make sure I’m on the guest list so I can chow them all down. 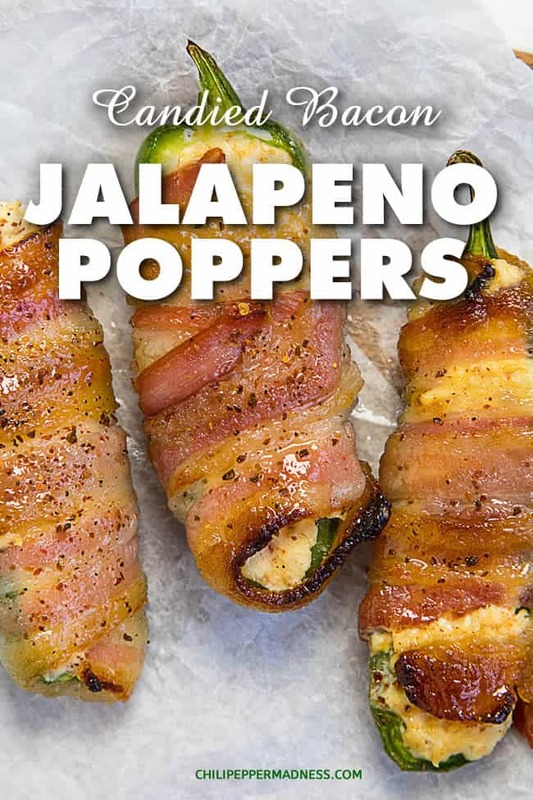 Consider them for your game day bashes, though I think pretty much ANY party or gathering would be appropriate for candied bacon jalapeno poppers. Holiday? Yes! New Years Eve? Yes! Birthday! Bring it on! Making them is simple enough. You’ll slice open the jalapeno peppers in half lengthwise and scoop out the insides, making them hollow enough for your stuffing. Next, mix the cream cheese in a bowl with honey, ghost pepper flakes, garlic, and salt and pepper. Go ahead and stuff each jalapeno pepper half with the spicy cheese mixture. For the bacon, rub each slice down with honey and brown sugar, then wrap each stuffed jalapeno half. I use toothpicks to hold everything together. Bake those babies up! Get wild with them! Party down! 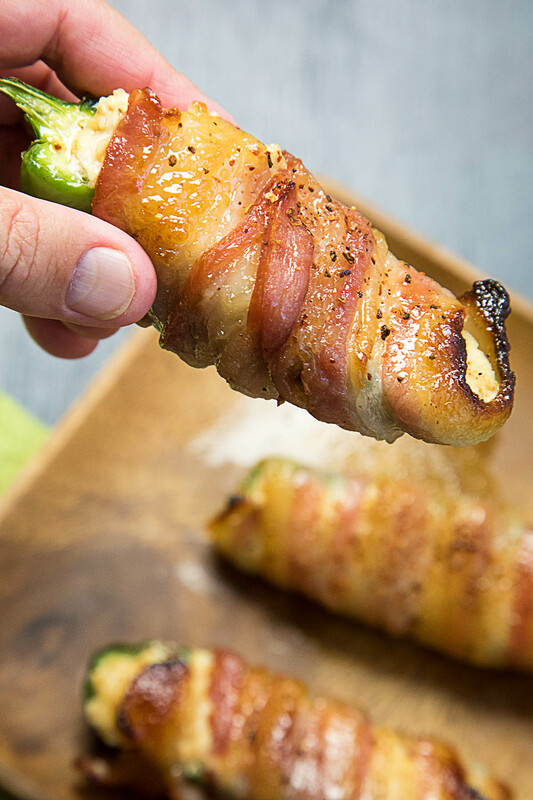 Go make yourself some candied bacon jalapeno poppers! I need these again. STAT. Sometimes the bacon can shrink up and partially fall off of the poppers, or they can be a bit soggy underneath, according to a recent comment. The key in achieving properly wrapped bacon is to use a large enough piece of bacon that wraps around properly. Note that the bacon will shrink up during cooking, so ensure a good wrap. Second, make sure you cook them long enough. If the bacon isn’t very crispy, keep cooking until it is. You can also hit them in the broiler a few minutes to get that crispy bacon, or sear them on the grill to achieve the same effect. If you fear the bacon will shrink up too much, use toothpicks to hold them in place. I’ve found, though, with the sweet elements with this recipe, the bacon holds together very nicely. Please let me know how these jalapeno poppers turn out for you. I hope you, and your guests, enjoy them! Add the cream cheese to a bowl and mix in 1 tablespoon honey, 1 tablespoon ghost pepper chile flakes, garlic, and salt and pepper. Mix well. Fill each jalapeno pepper with the spicy cheese mixture. You might have some leftover, depending on the size of your peppers. Just distribute evenly. Mix the remaining honey with the brown sugar and remaining ghost pepper flakes in a small bowl. Rub each slice of bacon with the spicy-sweet mixture. Get both sides nicely coated. Wrap each stuffed jalapeno boat with a slice of bacon. Pierce with toothpicks to hold the bacon, if desired. Bake the jalapeno poppers about 20-30 minutes, or until the peppers soften and the bacon is starting to crisp. You can blast them with the broiler a couple of minutes at the end if you need to. Remove from heat, cool slightly, and serve. Makes 16 candied bacon poppers. Looks awesome! I have had little luck with wrapped “anything” unless I pre-cook the bacon a little. The back side is always sogggy. This recipe looks like you have addressed that flawed outcome. Thanks, John. Yes, these turned out great for me, though pre-cooking them will ensure they come out nice and crispy. Thanks, Shaun! Yeah, these are definitely a new favorite. I need to make another batch!